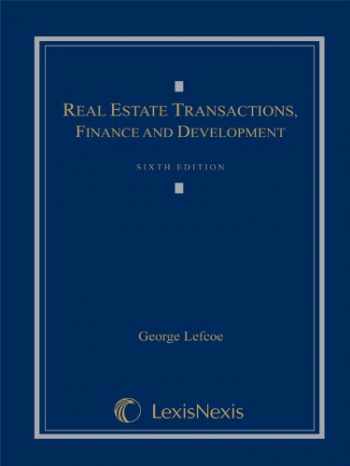 Acknowledged author George Lefcoe wrote Real Estate Transactions, Finance, and Development comprising 972 pages back in 2001. Textbook and etextbook are published under ISBN 1422470105 and 9781422470107. Since then Real Estate Transactions, Finance, and Development textbook received total rating of 4 stars and was available to sell back to BooksRun online for the top buyback price of $52.00 or rent at the marketplace. This book focuses on the purchase, sale, financing, and development of real estate and the significance of legal rules and institutions at various stages of these transactions. Arranged in clearly labeled, self-contained chapters, it allows maximum flexibility for professors to tailor assignments to the needs of various courses, such as:An introductory Transactions or Conveyancing course, covering the work of real estate brokers, purchase and sale contracts, deeds and closings, recording acts, titles insurance, and realty contract remedies;A Mortgage Law course, with emphasis on loan fundamentals and practical aspects of dealing with defaults, foreclosures, bankruptcy, and workouts; andAdvanced courses in selected topics concerning realty development and finance, including financing development, construction contracts, mechanics' liens, development profitability, real estate offerings as securities, public / private partnerships, land use settlements, federal income taxation of real estate, commercial leasing, and leases as financing instruments.